Told to “always listen to your inner voice and never forget to listen to the horse”, Anja says that most of the riders are always in a hurry with the rhythm and with their aids, and that it is important to relax and THINK! “Please watch, read, listen, try to learn – BUT never forget to ask when you think something is not logical or when you see the horse doesn´t feel well and then THINK about the answer! Classical dressage means happy and healthy horses and it is a logical system! With a five to twelve year plan for the future of dressage, Anja says “we should return to the system of classical riding”, as then we can see lightness and brilliance again, as well as proud and happy horses. “I hope that we can see in the future again real movements of Piaffe full of energy with horses with a big neck and short behind the saddle who work almost alone. I hope that we can also see a Passage that moves up AND forward, like a wave and involves the whole body of the horse and with the reins not short and the rider´s hands down. I want that people will not forget and practice again, the “Descente de Main” what is described in the book of the famous master “La Guérinère”. I hope that we will see again a trot in extension and not something what is called “Spanish trot” with a broken diagonal. 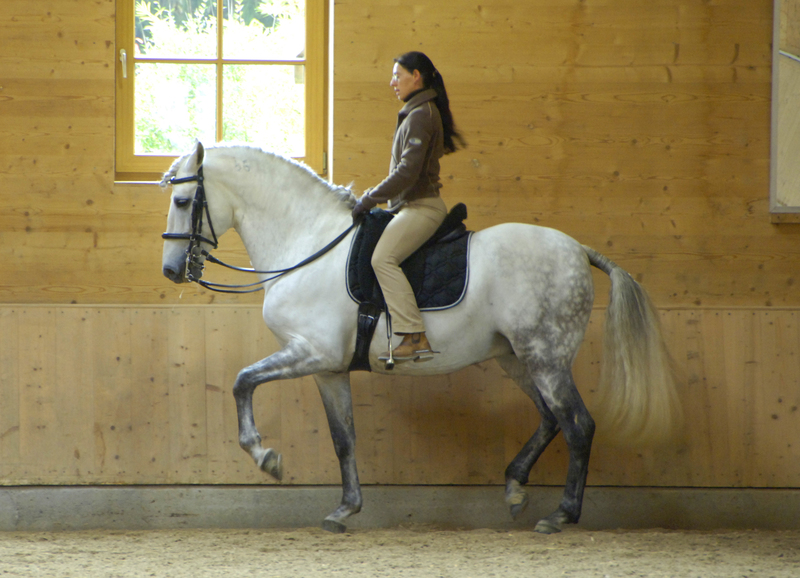 Means the front legs move a lot, but the hind legs don´t really follow. I hope that we can see real pirouettes again, a movement where the horse turns in the rhythm of gallop and doesn´t jump up and down with a stiff back. I hope to see horses who carry themselves and I hope to see horses WALKING again, in a free walk and also in a collected walk, but in their natural way! I hope that riders will understand that dressage means gymnastic for the horse: to make the horse straight, to put him into balance, to make the horse mobile and strong, only then he can carry the rider without problems. So dressage is something very healthy for the horse and helps him! Classical dressage is the base of all other disciplines!